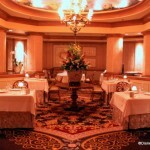 Mention Your Celebration When Making Advanced Dining Reservations: Whether you’re making Disney Dining reservations online or over the phone, be sure to mention that you’re celebrating your honeymoon or anniversary while at Walt Disney World Resort. 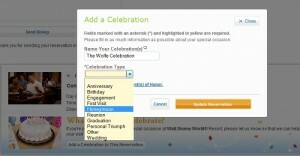 Just noting your celebration in the notes of your reservation will often bring wonderful results! Usually these buttons will garner you lots of congratulations, and will definitely help restaurant CMs to remember your celebration! Remind the Cast Members at the Restaurant: If you’re really set on receiving a special treat, remind the Cast Member at the podium when you check into the restaurant, as well as your server, that you’re celebrating. Usually this isn’t necessary, but if you’re in a contest to reap in as many free cupcakes as you can, go for it! Request a Specific Table Location: If you’ve always wanted to sit at an outdoor patio table to see Illuminations from the Rose and Crown, or if you’ve yearned to have the perfect window table to see Wishes from the California Grill, don’t forget to request that special seating when you check in at the restaurant podium. Your “special event” status might not help you out one iota, but you never know… and it never hurts to ask. 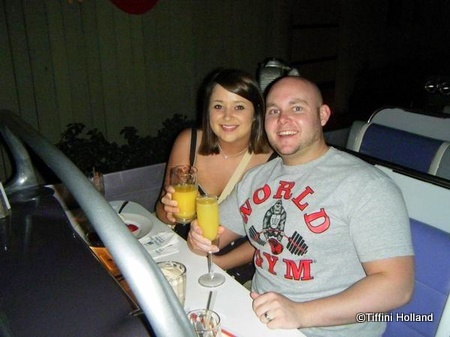 Below are some photos of the treats we received from Disney Restaurants during our honeymoon trip. Fellow Disney fan @TiffiniHolland also kindly contributed honeymoon photos for this post! Boma treated us to a wonderful plate of bite-sized desserts, including a gorgeous chocolate truffle that was absolutely delicious! 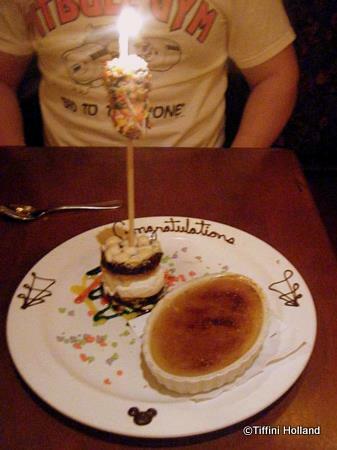 Le Cellier decorated a Congratulations plate and topped the Hollands’ S’mores dessert with a candle! 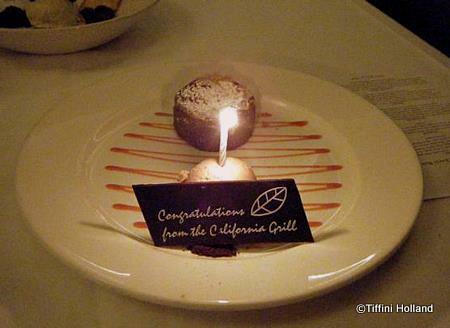 California Grill offered their congratulations in chocolate form! Disney restaurants vary significantly from place to place — and even day to day — in what kinds of desserts* they come up with to celebrate honeymoons and anniversaries. Your friends who visited last Spring may have been treated to an over-the-top complimentary dessert created by one of Disney’s signature chefs, while you might be treated to a frosted cupcake with a candle. 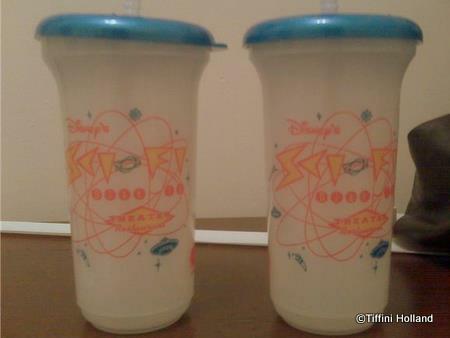 Hollywood Studios’ Sci Fi Dine-In was the only restaurant that did not give us dessert treats. But Tony, our waiter, who has been there more than 20 years, brought us a signed card by the staff and two Sci-Fi cups filled with caramel popcorn and champagne mimosas, which we used while he toasted us. There are wonderful experiences to be had if you welcome Walt Disney World into your celebration! And while no two guests’ visits are ever the same, you can always expect some hearty congratulations…and possibly some sugary treats…during your trip. Has anyone else celebrated their honeymoon or anniversary at a Disney park? What was your experience? I’d love to hear what you encountered, along with any tips and tricks you can share for making a Disney celebration trip a memorable one. Please share your story in the comments section below! *Disney celebratory desserts can come in many forms, and while they could be complimentary, they can just as easily be a special plating of a dessert you’ve already ordered and will be paying for. We celebrated our honeymoon at Disney World in 1999. Back then, there were no celebration buttons, but we did note our honeymoon when we made our ADRs. The only real treat I remember was at Cinderella’s Royal Table. Our table was decorated with confetti and ribbon and we were given two champagne flutes, packed up in a box with tissue (we obviously couldn’t use them in Magic Kingdom!). We also had some nice surprises from mousekeeping at our resort and got an autographed photo of Mickey and Minnie with a congratulatory note from them delivered to our room. The one thing we found, which I think is what your post gets at, is to not be shy about letting folks at Disney know it’s your honeymoon. Thought it won’t guarantee anything, as you said, it will maximize your chances of getting some special treatment. This really is a once-in-a-lifetime opportunity, so don’t feel guilty about advertising your newlywed status! Perfect timing! My Disneymoon is in October so I’m just starting to think about all this stuff. 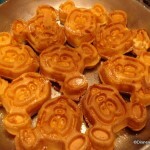 Any insight on disney cruise line food treats for honeymooners? We are doing a surf and turf honeymoon (half land, half sea). One thing, not sure if it is a rumor or not. I heard on a reputable podcast that they were discontinuing the “just married” button. Just incase I picked mine up on my last trip. I heard this a couple months ago, but haven’t heard it since so it might not be true at all. Anyway thanks agains for the blog! Like I said, perfect timing!! We went to Disney for our honeymoon in 1993 (my anniversary was this past Saturday) and we didn’t get anything, that I recall, from any of the restaurants. What we did get was phenomenal! We were staying at the Grand Floridian (our ressies were for whatever a ‘regular’ room was at the time). When we arrived, the CM at check-in told us that we could stay in a honeymoon suite for the first night, as it was available. It was fantastic! A bottle of champagne was left in our room at the end of the day. The next day, we packed up our bags for the change to our new room. When we returned, the CM said that they didn’t need the room after all and we could stay there all week! I don’t know the name of the room type (I can only say, ‘expensive’, lol) but it was two rooms and it is one of the turrets you see at the front of the hotel. Anyway, we got back to the room and there was an engraved note that basically said, “Sorry for the inconvenience,” and a plate of tuxedo, chocolate dipped strawberries! This was our only concierge-level experience, too. We had breakfast every morning and dessert every night. I look at that room type now and I am FLOORED at the price. While we could actually afford to stay there, I am beyond frugal and it kills me to part with that kind of money for a hotel stay! So…Pop Century it is for us and we love it! We celebrated our honeymoon at Disney World in June 2001. Still not honeymoon buttons at that time. Do not think I noted anything on our ADRs. They did know at the Beach Club Resort that we were there on our honeymoon. Our room was upgraded to a pool view. In addition to this, when we went on the Epcot behind the scenes tour, our guide gave us a cute group of beanie babies as gifts. A few cast members along the way knew we were there for our honeymoon and said congratulations. Things have changed a lot since the year of celebrations made people note all of the items that they celebrate at Disney. Biergarten – nothing special for the anniversary, but wow did our kids love the band!! All in all, I thought it was great! Like I said, if you’re not expecting anything, whatever you get will just be icing on the cake. Back in the Fall of 2006, my wife and I made our 2nd trip to Disney World together. During our check-in at the Coronado, the Cast Member asked how long we were married. Even though our anniversary is in May, we said “recently”. Out from behind the desk came two anniversary buttons, which we were instructed to wear. Our first positive experience with the buttons came when we visited Guest Services on our first full day at the Magic Kingdom. I was trying to convince my wife to go to a MNSSHP, but she wanted to know more about it. Not only did my wife get a great explanation of the event, but we were handed 2 free tickets for the party the next night. Our second positive experience with the buttons, came later in the week when we dined (for the first time) at Le Cellier. We ended up with a great CM and really struck a good chord with him. He saw our buttons and ended up giving us a couple of glasses of sparkling wine at the end of dinner. We had also ordered a bottle of wine with our dinner and when it came time to pay for the wine (we were on the dining plan no less), we didn’t get a bill. I asked the CM about the bill, and he said “it’s on me.” Talk about a great late anniversary gift! Wow, these stories are getting better and better! Shayne — I’ve heard tell of the champagne flutes at CRT! Too bad we didn’t go there during our trip! Jessie — YAY! Congrats! Hopefully they’ll still have the Just Married buttons, but I’m glad you snagged yours just in case. Keep us updated on how your honeymoon goes! Have a wonderful time! Janna — Happy Anniversary! I’m am utterly and completely jealous of your honeymoon suite upgrade, but also so grateful that it happened to such a wonderful person! 🙂 Thanks for sharing such a cool story! TAF — Thanks for the stories. Wow on the free upgrade room! 🙂 You guys are one of my favorite Disney couples, hands down. Elissa — Thank you for sharing about your trip! Congrats on your anniversary! 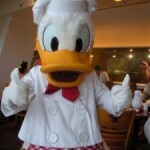 Isn’t it amazing when Disney CMs find the time to celebrate with you during their busiest season?!? My husband and I celebrated our first anniversary in Disney in 2002. We also received the champagne flutes from Cinderellas Royal Table. At Narcoossee’s they served us free wine. In fact, I’m not a big wine drinker and they were determined to find me a wine I would like. They brought me out a few different ones before I found one I liked. They were very kind. We had an assortment of other treats I can’t remember now but those were the big two. That’s why I love Disney. They really know how to make things magical! My husband and I just returned for our Disney Fairy Tale Wedding and Disneymoon. It was an amazing experience and we wouldn’t have changed a thing! I heard various reports of wedding/Disneymoon upgrades, desserts, celebrations, etc., so I really wasn’t sure what to expect when we got there since reports varied so much. While we did receive an upgrade on our Contemporary Resort Deluxe Garden Wing room, we did receive a few surprises from the staff. On our first night, we returned from dinner to find a lovely, congratulatory note and a delightful tray of cheeses, crackers and fruit on our bed. On our actual wedding day, we came back to the room to a very cute (pre-recorded) message from Mickey and Minnie. As far as restaurants go, we received a complimentary dessert from Kona Grill. Our desserts at Le Cellier and Whispering Canyon, which we ordered, were accompanied by two glasses of champagne and a congratulatory card. We suspect we would have received a free dessert at Yachtsman Steakhouse based on our waiter’s conversations, but alas we were too stuffed for dessert! We did receive special menus to take as souvenirs. Our breakfast at Crystal Palace included a confetti heart on the table…and some pins that we didn’t have to trade for…which was almost better than free dessert for 2 pin freaks! All in all, I think it was the constant congratulations from EVERY single CM we saw while wearing our buttons and/or wedding ears that truly made the trip special. It was a nice reminder just how well the staff at Disney World is trained. The Congrats! never seemed forced or annoyed. But free desserts and champagne were nice, too! My wife and I celebrated our Disneymoon in 2008. While there we decided to go out for a special dinner at Artist Point. My wife made sure to tell them when she made the reservation that we were celebrating our Honeymoon. When we went up to the hostess she looked for our reservation and congratulated us immediately. We were congratulated by our server who brought out personalized menus that had our names on it and the date that we were married. While we were eating the general manager came over to our table to offer his compliments and to offer us a free appetizer. At the end of our meal our server came back out to us and let us know that the chef was preparing a special dessert and champagne toast that would be on the house. We thanked all of them very much for the splendid service. I don’t think that our celebration was recognized everywhere, but when it was the CM’s went over the top. I tell everyone that I know that is getting married to go on a Disneymoon because you won’t be disappointed. Emily — Those are great stories! We celebrated our honeymoon at the Contemporary, too! I love that they gave you pins without even knowing you were pin freaks — so cool. Brett — Congratulations! I never fail to be impressed by the CMs and how they go over and above to make sure guests feel special and taken care of. Thank you for sharing your awesome story with us. My husband and I celebrated our Disneymoon in October 2007. We received lots of free chocolate chip cookies. At Concourse Steakhouse they took a picture of us. My favorite memory of the trip was a magical moment from another guest. My husband and I were enjoying dinner at Chefs de France and struck up a conversation with a couple sitting at the table next to us. They sent us two glasses of champagne to congratulate us. It’s definitely something we’ll never forget. I think it’s best not to go expecting anything, that way you won’t be disappointed. We celebrated our honeymoon in June 2009 and after a very long flight from Manchester, UK, we had a lovely meal at the Plaza in MK. We were told tinkerbell had visited our table and were greated with mickey confetti in a heart shape and after our meal a free chocolate ice cream shake, complete with metal pail. YUM. 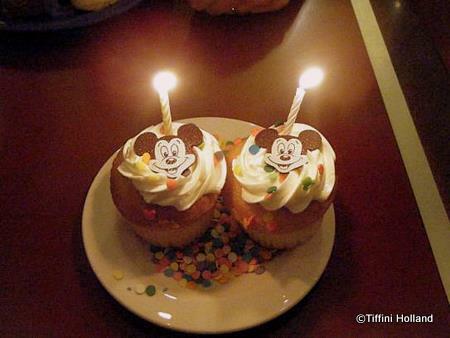 We too got the cupcakes at Chef Mickeys! And lots of free things like fastpasses, bottle toppers and food. Brad — Yep, agreed. Don’t expect anything, and then everything will be a great surprise. Nicola — Hooray! Congrats on your 1 yr anniversary!! I like free fastpasses…sounds good to me! My husband and I went to WDW for our honeymoon in June 2008 and got lots of perks. Our room at Port Orleans French Quarter was upgraded to a water view, our table at Crystal Palace was decorated with confetti and ribbons, our bill at the Crystal Palace was “taken care of” by Disney, free sudae at The Sci-Fi Dine-In Theatre, the Rose and Crown and the Sci-Fi gave us cute congratulations certificates, and we got to ride our virtual rollercoaster twice in a row at Disney Quest! Also, a family at Sci-Fi Dine-In heard our waiter mention that it was our honeymoon and they gave us their Fastpasses for Toy Story Mania! I’m soo very excited I found this blog and cant wait till our Disneymoon 🙂 My fiance is in the Air Force and will be returning from Iraq for us to get married in May! We are then taking our trip for a week to Walt Disney World.. I hope we encounter some of these amazing perks !! Eve — Thank you for your comment! It sounds like you’ll have so much magic coming your way in May! Congratulations! 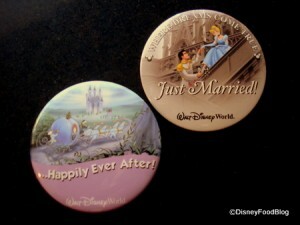 My better half and I will be celebrating our 1 year anniversary in March of 2011 at Disney World. After reading all of these stories I am looking forward to letting the staff know what we are celebrating. We are both vegan and I’m a little hesitant about wearing the buttons in restaurants because I don’t want to be rude and not accept a dessert if it is brought to us. Any thoughts or ideas? Thanks! Kyla: when the waiter first comes, ask him what he recommends for vegans, as you two are vegans. 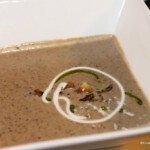 Hopefully he will not forget that, and the chef will personally make you a dessert to your liking! While this post is old, I just wanted to throw in my experience with a Disney World honeymoon! My husband and I were married in March and we experienced one of those over the top honeymoon experiences! We received free dessert and a window seat to watch Illuminations at Tokyo Dining at Epcot. We received a free dessert at Restaurantosaurus at Animal Kingdom. We were called over to one of the snack kiosks and received free popcorn, and given a free dessert at 50’s Prime Time Diner (as well as having our waitress make the whole room give us a round of applause) at Hollywood Studios. And, when we arrived at the front desk for check in at the 50’s Prime Time Diner, some of the staff had rustled up a pair of Just Married buttons for us which have now been discontinued, so that was a huge treat in our eyes! We also had a decorated table for us at Cinderella’s Royal Table and extra fuss over us from the princesses who came by! Plus, they gave us a wand and sword reserved for the children, which we enjoyed! Add to that the free fast passes we received from cast members and visitors, being escorted by staff to the front of the line for many rides, a Congratulations around every corner from every cast member we saw, extra time and fuss being made by characters we met, and even being approached by a cast member pin trader who gave me a Bride pin just because, and we had a very magical honeymoon indeed! We even had a school group want to take pictures with us because we had our bride and groom ears on! I’d say that also makes a huge difference. Don’t just mention your honeymoon on your reservations. Wear your pins and make sure to wear your ears! We seemed to get a lot more preferential treatment over other brides and grooms we met over that trip because we were visibly decked out for it, and they weren’t (and we only knew this because we kept getting approached by other honeymooning couples asking us questions about it and wanting to get in on the action!). My fave place in the world is WDW and my fiancé told me we could celebrate our honeymoon in Florida (all the way from the Netherlands). So of course we’re going to WDW for a couple of days, won’t be staying in the resort. Was planning on getting him his first pair of personalised ears, but now I’m thinking he’s getting 2 pair; one with the top hat and one with his name. Ow and a tip for all the other WDW lovers: watch the fireworks from the docks (not the Magic Kingdom side). That way you see the Disney outline with the fireworks above it instead of standing up close in between the masses. We’ll be doing this the first evening in Orlando since it’s free to get there. My husband and I visited Disney 2 times before we married in 1993, had our honeymoon there, and then this fall we will be going to Disney for our 20th anniversary. We didn’t get anything special for our honeymoon, but we had a great time anyway. I have found a few anniversary buttons on eBay to wear. Disney has always been a special part of our memories. We even took my in-laws in 2003 and treated them to the vacation and dragged them around like they were the kids since it was their first time seeing it. We are hoping this next trip will be just as special. I am so excited to hear about this! We are getting married in Sarasota in 2 weeks and then celebrating our honeymoon at Disney! It’s so nice that they recognize this and make your time that more special! My husband and I were married at the Boardwalk Hotel in January 2013. We hosted our reception dinner at Boma in AKL. All of our guest enjoyed the food and it was so nice not having to plan a catered meal. The hosts at Boma lead us into the seating area with a drum and dance processional, it was so much fun! The chef surprised us with a treat upon the end of our meal (which they were happy to provide a box for as we were so stuffed from the buffet!). We were presented with a plate of three chocolate truffles and three chocolate dipped strawberries as well as two glasses of champagne. We stayed at AKL for 5 nights for our Disneymoon. I had booked two nights with animal views, and three nights in a standard room. We were upgraded to an animal view for our entire stay. We had a wonderful time celebrating in Disney, would not have changed a thing! Wonderful Anniversary and Honeymoon destination with awesome activities. This is really a good idea to surprise my wife. Thanks. We got married last September and went on our honeymoon to Disney World. We did support our Just Married button and everyone did say congratulations but we didn’t get any of the free extras, which doesn’t matter since we had an amazing time anyway. But just so to let people know they shouldn’t expect free desserts or complimentary drinks. Oh and it looked like everyone was wearing a button. Just Married, First Visit, Anniversary, Birthday, something else. Some even had more than one. So I understood they couldn’t give everyone something for free. Just want to thank everyone who spoke to us and asked how many years we had been married. Disney anniversary trip, March, 2018. We started out at Disney 38 years ago for our honeymoon and every 10 years we came for our anniversary. Then the year of your 33rd anniversary, we moved to Florida from Tennessee and we have been to Disney each year on our Anniversary. 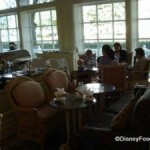 We are saving now for our 40th anniversary to be at the Floridan Hotel. We will let them know it is a very special anniversary for us as we will be 71 and 72 years old. We are finding it harder and harder to get around to all of the parks, but we enjoy just driving up for a wonderful lunch a few calm rides, like Toy Story. and just enjoying watching all the different people who visit Disney. Thank you Disney.